Discover a reliable and high quality choice for driveway paving in Bergen County NJ when you call (201) 327-5258 today. We will set up an appointment for one of our contractors to come and assess the situation, then provide you with a comprehensive solution. Click here to see our current online sales and coupons. 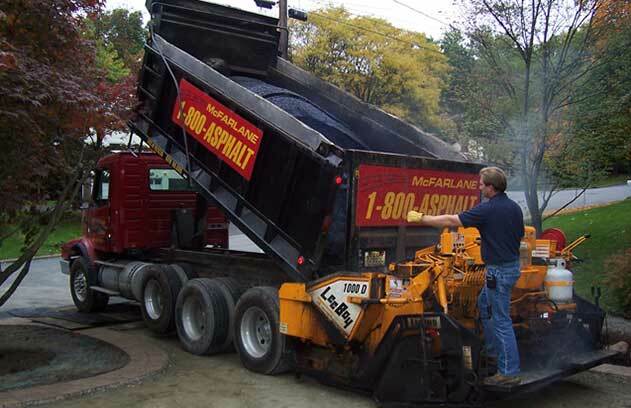 There is a lot more to being a high quality asphalt paving contractor in Bergen County NJ than just mixing and pouring asphalt onto a parking lot or driveway. The ratio of aggregate to binder to filler must be correct, the ground beneath the asphalt must be prepared and leveled properly and there must be sufficient drainage. It is important for a paving contractor to be expressly dedicated to his craft, and to have the happiness of his customers on the top of his mind. When you experience to that equation, you have a paving contractor like McFarlane Asphalt. Are you interested in what others are saying about our services? Click here to find out! As a top driveway company in Bergen County NJ, we have a great deal of history in the local area. We are a family-owned and operated company that was founded in 1995, although we have 30 years of actual asphalt paving experience to draw from. Through the years, we have become a permanent part of the community, working on projects as varied as huge, commercial parking lots to small, backyard patios. We have developed a reputation for reliable, affordable, high quality service that keeps us busy all year long. Do you need a new driveway in Bergen County NJ? Most of the time, we are able to get started on paving jobs within one day of a customer placing the call. This efficient service, plus the fact that we offer free estimates for our services, makes us a preferred choice amongst people and organizations that want quick results. Damaged, aging asphalt creates a safety hazard, and it looks terrible, so having the issue dealt with as swiftly as possible, by one of the leaders in the industry, is a benefit most customers can’t ignore. If you have you need a new driveway in Bergen County NJ and want to be sure you’re working with a contractor you can trust, call McFarlane Asphalt at (201) 327-5258 so we can give you the results you need.